Various national and international agencies have developed and reported accounting systems to track progress in energy efficiency improvements. Most of these energy efficiency accounting systems (EEAS) are based on index decomposition analysis and the logarithmic mean Divisia index (LMDI) has emerged as the main decomposition method used. We discuss the fundamentals of LMDI with specific reference to energy efficiency analysis and its application to national EEAS development. The main design dimensions and elements of an EEAS are explained. The flexibility of the LMDI approach has allowed analysts and national agencies to tailor the EEAS to suit their national needs and policy purposes. We conduct a literature survey of the implemented and proposed EEAS and summarise their key features. In view of its growing importance, the extension of the EEAS to an energy-related emissions accounting system to track progress towards climate mitigation targets is introduced. 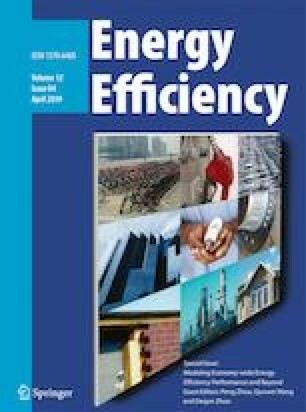 Finally, the strengths and limitations of an LMDI-based EEAS for the tracking of energy efficiency trends are discussed. Asia-Pacific Economic Cooperation (2011). 2011 Leader’s Declaration. Hawaii: 19th APEC Economic Leaders’ Meeting. Access at http://www.apec.org/Meeting-Papers/Leaders-Declarations/2011/2011_aelm. Accessed 7 February 2018. Korean Energy Economics Institute (2016). Energy efficiency indicators by sectors. Ulsan: Korean Energy Economics Institute. Access at http://www.kesis.net/. Accessed 7 February 2018. National Energy Policy Development Group (2001). Reliable, Affordable, and Environmentally Sound Energy for America’s Future. Washington D.C: National Energy Policy Development Group. Access at http://www.nrc.gov/docs/ML0428/ML042800056.pdf. Accessed 7 February 2018. ODYSSEE-MURE. (2018). Decomposition tool. France: Enerdata. Access at http://www.indicators.odyssee-mure.eu/decomposition.html. Accessed 7 February 2018.